Jang Sung-taek was born in 1946 and married the daughter of Kim Il-sung, Kim Kyong-hiu, in 1972. In 1982 he became the vice-director of the Worker's Party of Korea's Organization and Guidance Department. The OGD is one of the most powerful bodies within the Democratic People's Republic of Korea's (DPRK) government and is responsible for the organization and vision of the Party, ideology, propaganda, and North Korea's infamous cult of personality. In 1992 he became the director of the OGD and was made a full member of the WPK's Central Committee. During a political purge, a person is either killed outright, sent to one of the many concentration camps to die, or sent to a prison (or camp) to be "rehabilitated". While undergoing rehabilitation prisoners are subjected to intense physical labor, little food, and long hours of self-criticism sessions which are ubiquitous in North Korean society. The aim of these sessions is to expunge oneself of impure thoughts and to re-instill "correct" thought and ideology as promulgated by the Kim's. By 2006, Jang had reappeared and accompanied Kim Jong-il on an official trip to China. In 2007, he was promoted to the post of first vice-director of the WPK and later appointed vice-chairman of the National Defense Commission which is the highest military body. 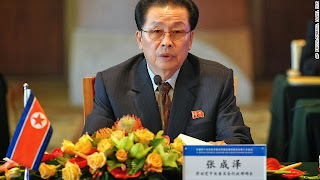 After the death of Kim Jong-il in 2011, Jang continued to serve at various posts and, at least on the surface, was a supporter of Kim Jong-un's succession. Jang was responsible for a wide array of projects within the country and helped see that the Yalu River Bridge came to fruition. The bridge spans the Yalu River which serves as the border between China and the DPRK. It is both symbolic in nature and will become a major economic artery. Unfortunately, the good times were not to last for Mr. Jang. On December 3, 2013, South Korean sources reported that Jang had been removed from his posts. Then, in a move reminiscent of Stalin's purges, Jang was "erased" from various documentaries and news reports shown nationwide throughout December. The act of removing a person from images, statues, films, official documents, etc. is called damnatio memoriae and it seeks to erase the memory, and thus deny the very existence, of someone who has run afoul of a government or leader. On December 8th, Jang was expelled from the WPK and arrested. All of this was broadcast on state TV. His fall from grace was probably the most public of any dismissal of a member of the Kim family. Naturally, speculation is rampant with people saying he was ousted because he was corrupt, because the military-first faction of the country had him removed (he was a supporter economic reform over Songun), or that he secretly desired to rule the country. When it comes to finding the truth in North Korea it is all but an impossible task. Regardless of the reason, Jang was executed. Under the direction of the Party, a military tribunal was held by the Ministry of State Security and he was found guilty of, and confessed to, multiple crimes. On December 12th, the Korean Central News Agency (KCNA), the state run and primary news agency of the country, issued a 2,700 word statement which detailed his alleged crimes. In typical authoritarian communist flourish, they called Jang worse than a dog, a thrice-time traitor, and accused him of a multitude of crimes. I say his alleged crimes because the world will likely never know the full story. Even the testimony he gave was likely written by the government and provided to him. To find a recent example of DPRK fabricated testimonies one has no further to look than the case of Merrill Newman. I'd like to take a look at some of his alleged crimes and try to explain what they mean, provide some context, explain why they're important, and hopefully tie it all together. 1. The first real charge against him was that he led a faction of counter-revolutionaries which attempted to overthrow the government by using "all sorts of intrigues" and attempted to grab the reins of power for himself. -- Hwang Jang-yop, the highest level defector from North Korea, speculated before his (Hwang's) death that Jang could be a possible successor to Kim Jong-il. The issue of succession came to the forefront after Kim Jong-il had a stroke in 2008. Prior to this, Kim Jong-un was basically unheard of, even within North Korea. And so, unlike his father's decades long grooming, the process for Jong-un's succession was hurried and uncertain. The statement also claims that Jang enlisted the aid of "discontented elements" and those who had, in the past, been "problematic" - which I discuss somewhat below. -- According to Jang's testimony, he had also planned to use his allies in the military to achieve his coup. This is not out of the realm of possibility. From a simple logistical standpoint it's obvious that he would need to enlist the military to complete the task. The personal bodyguard corps (Unit 963) of the Kim family has anywhere from 95,000 to 120,000 dedicated and intensely trained officers. Also, the military runs a decent chunk of the economy and is the primary exporting body. Beyond that, the military serves as a major source of labor due to its size (around 9 million including reserves) and since the official policy of the nation is to support the military the military's reach is pervasive and it is indispensable as an institution. There's also precedent for the military to be involved in a coup attempt. In 1996, in the middle of the famine, the Korean People's Army 6th Corps planned a coup, however they were discovered before they could carry it out and 340 leaders were either killed or otherwise punished. The main obstacle to a military coup is the disjointed nature of the Korean military. Unlike modern powers, the various branches of the military (army, navy, air force, etc.) rarely engage in joint exercises and there is severe doubt as to their interoperability. On top of that, the level of mistrust between the leadership and its generals (and among the generals themselves) means that only a few top-level military personnel know how the full military machine works, making it less likely for a coordinated coup to even be plausible. 2. In several sections he is charged with economic crimes and using his authority to extend his own reach, increase his wealth, and trying to usurp the national government. One of the more propaganda driven charges says, "He let the decadent capitalist lifestyle find its way to our society by distributing all sorts of pornographic pictures among his confidants since 2009. He led a dissolute, depraved life, squandering money wherever he went." Additionally, "he schemed to drive the economy of the country and people's living into an uncontrollable catastrophe," and that he embezzled millions of euros for his own benefit. They also charged him in connection with the devastating currency revaluation of 2009 which erased the life savings of nearly everyone and led to the execution of Park Nam-gi, the then director of the Planning & Finance Department. --Jang had substantial control over a large segment of the economy. Obviously, if he wanted to rule the country he would need to control the economy, but it's just as likely that he was a reform-minded individual and tried to use his resources to improve the state of affairs. Any attempts to deviate from the top-down, totalitarian driven, fully planned economy is seen as betraying the desires of Kim Il-sung, who is still the president of North Korea despite being dead for nearly two decades. And, any time something goes wrong in the economy blame is placed squarely on capitalistic ideals, reactionaries, and factionalists who have let impurities of ideology (ideology, not basic mathematics or economics) bring hardship down upon the heads of the people. -- The idea that he schemed to drive the economy into an uncontrollable catastrophe could prove difficult for the government to really explain to the people. Anyone over the age of 15 would remember the famine, and even today thousands routinely die of starvation. Kim Jong-il's dogmatic insistence on the military-first policy (Songun) has meant that the military receives food, clothing, heating, and medicine first. It has also meant that the only thing Kim succeeded at during his 17 year reign was the development of nuclear weapons and ballistic missile technology. He failed at solving the food crisis, the energy crisis, and failed at improving the lives of 24 million North Koreans. And people know this, even if they can't talk about it except under the most secretive conditions. -- However, there have been several reports of other members of the elite who have run afoul of the leader due to their extravagant lifestyle. I recall one case where a man was purged because his villa was in plain sight of the village and it looked larger than one of Kim Il-sung's. There is little doubt that the ruling elite have no qualms about largess living. That being said, I find it difficult to believe that there aren't at least some who have a desire to improve the country and the standard of living of the average citizen, even if it's only because they want to live an even more extravagant lifestyle. -- Lastly, on the charge of spending millions (4.6 million in one year to be exact), I can only imagine how absurd this charge must appear to those within the inner circle of leadership. In a truly communist state, especially a poor one, the idea that anyone could be keeping profits and spending millions on themselves at the expense of the masses would be worse than blasphemy and utterly horrifying. But, at least in the case of the Kim family, spending millions is expected. To rise among the ranks officials are encouraged to give vast sums of cash to the Dear Leader and for Kim Jong-il's birthday, Office 39 presented him with upwards of $20 million each year. Kim Jong-il spent millions on alcohol, food, palaces, "loyalty" gifts to officials, rare animals and much more. He even had $4 billion stowed away in foreign banks by some estimates. 3. The next charges against him that I will talk about gets into the details of his betrayal of trust. It says, "It is an elementary obligation of a human being to repay trust with sense of obligation and benevolence with loyalty." He is accused of having "an ax to grind" and, until Kim Jong-il died, of quietly plotting to grab power. Once he died, it goes on to say that Jang actively bribed people and built up a "little kingdom" all in the name of his desired coup. -- The Ten Principles compel every citizen to respect the Kims and to offer up complete and never wavering loyalty to the regime. Almost every one of the ten principles and sixty-five sub-clauses at least partially mention obedience to the state and to the Kim family. Principle III says, "Make absolute the authority of the Great Leader Comrade KIM Il Sung. Affirming the absolute nature of the Great Leader Comrade Kim Il Sung’s authority is the supreme demand of our revolutionary task and the revolutionary volition of our party and people." Later editions have been amended to include Kim Jong-il and Kim Jong-un in the appropriate places. This alone means that any dissent from the supreme leader is a crime against the martyrs of the Liberation (Korean War), against the "great heart" of Kim Il-sung, and against the very soul of the nation. A further related crime was that "he committed such anti-party acts as systematically denying the party line and policies." -- Despite the Principles, the older generation of North Koreans remember when the north was actually better off than the south. During the Japanese occupation (1910-45), Japan invested heavily in factories, railroads, and industry in the north, leaving the south to serve as the bread basket of the peninsula. And so after WWII, when Korea was split between Soviet and American spheres of influence, the north retained its position as an industrial powerhouse for the region. Even after the Korean War, North Korea benefited from Soviet & Chinese patronage during which North Korea played each country off the other and extracted billions in aid and trade. It wasn't until the late 1970s when the south finally began to overcome the north in terms of economic and technological development. When the USSR finally dissolved, the loss of patronage compounded systemic economic problems and, along with the inherent flaws of its planned economy, created a downward spiral which led to a famine which killed upwards of 1 million. -- North Korea hasn't fully recovered from either the famine or the loss of friendly trade and patronage. On top of that, international sanctions have slowly chipped away at the vast wealth of the ruling elite; although the average citizen suffers disproportionately from them. As I said earlier, I find it difficult to believe that there aren't some who would like to see real reform in the county, especially by the elite who have access to a vastly greater range of information and can see the truth about the modern state of the world and their dying country. I could also easily imagine that Jang really did have an ax to grind. He had loyally served the state for decades, knew how the system worked and saw its flaws, and then was passed over without a second thought in favor of an untested kid in his twenties. This would have been similar to the events surrounding Kim Jong-il's ascent to power, when several of his father's friends and relations, who strongly disapproved of dynastic succession, were killed or removed from their posts leaving no doubt as to who really held power. He behaved so arrogantly and insolently as unwillingly standing up from his seat and half-heartedly clapping. He was so imprudent as to prevent the Taedonggang Tile Factory from erecting a mosaic depicting Kim Il Sung and Kim Jong Il and a monument to field guidance given by them. 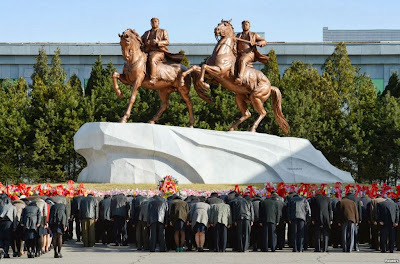 Moreover, Jang turned down the unanimous request of the service personnel of a unit of the Korean People's Internal Security Forces to have the autograph letter sent by Kim Jong Un to the unit carved on a natural granite and erected with good care in front of the building of its command. He was so reckless as to instruct the unit to erect it in a shaded corner. Due to his persistent moves to create illusion and idolization of him his flatterers and followers in his department and organs under it praised him as "No. 1 comrade." He made the reckless remark that "the rewriting of the construction law would solve the problem. If you've ever seen a video of a Kim walking into a room or being praised you'll see how enthusiastic, and robotic, the crowd is. Clapping and shouting "Ten Thousand Years!" is protocol in a crowd setting and anyone not showing enough respect becomes suspected of disloyalty. To most of the world, the idea that "half-heartedly clapping" would be seen as something serious is laughable, in North Korea it is taken very seriously. Kim Il-sung worked hard at developing the idea that he was the father of the nation and, in a very real sense, the respect he receives even today is one that only a godlike paternal figure could be due. Likewise, each generation of Kim is seen as the sun, the loving father, the protector, the provider, the breath of life. Korea, and much of that part of the world, is a deeply Confucian region. Respect and patriarchy are an integral part of their society. North Korea simply took long held Confucian beliefs (along with co-opting other religions) and twisted them in such a way as to exert total control. You clap because if you don't, you are disrespecting the person who directly feeds you. You live and breathe by the will of the party and the mind, body, and soul of the party is the supreme leader. The cult has actually been the cause of friction between the DPRK, China, and Russia - despite similar cults to Mao and Stalin. However, North Korea's cult far surpasses any other. Kim Il-sung began laying the foundations of the cult before WWII was even over and once he was installed as the leader of North Korea (by the Soviets) he started to enshrine the cult into the fabric of society. At first, it was a matter of genuine respect owed to a very real nationalist hero and so it didn't seem too odd. As time went on with new generations born, and a mass purge in 1953, the cult grew into something compulsory. When Kim Il-sung died, the nation erected thousands of monuments to his honor as they continue to do today. There are well over 40,000 statues and murals throughout the country and each year upwards of 40% of the nation's entire budget is spent on maintaining the personality cult. The mausoleum of Kim Il-sung and Kim Jong-il is rumored to have cost $1 billion all-in-all. The expanse of the cult begins in school, where children are taught that they are fed and clothed by the "grace of the Chairman". Schools also contain rooms dedicated to the life and teachings of both former Kim's. At home, a wall is dedicated solely to three pictures, one of each Kim. And those pictures must (by law) be cleaned daily with a special cloth and if they're not you can be punished. Once you reach adulthood you must wear a lapel pin bearing the likeness of Kim Il-sung and Kim Jong-il. Beyond that, marriages are often performed in the presence of images or monuments and everyone is required to bow before the nearest monument during festivals and holidays (which, by the way, include the birthdays of the leaders). Public buildings must also carry the image of the Kim's, the image's size determined by the size of the building. Any title expressing highest respect, love, affection, or political station, such as "No. 1 Comrade", is exclusively used to refer to the supreme leader. Thus, anyone using such a title for anyone else is gravely disrespecting the leader and it's tantamount to blasphemy. 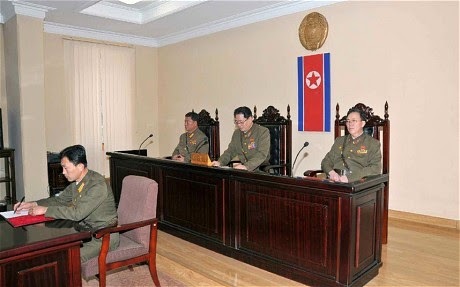 Regarding the constitution, the national constitution of the DPRK is little more than a pretty piece of paper in most respects, except that it enshrines the supreme leadership of the Kim's and enables the various political organs to fulfill their mandate - the edification of the Kim family and to ensure total loyalty and subservience to the leader and Party. The constitution and other official documents and agencies are seen as the will of the supreme leader, and even more specifically, the will of Eternal President, Kim Il-sung. To suggest a change to it without guidance from the leadership or to suggest any change which may diminish the power and sovereignty of the leader and party is similar to an attack against the leader himself, the ultimate form of treason. In the end, I think it is equally plausible that he was killed because he was a reformer, killed because he really was a traitor, or killed for a mixture of reasons. If he was reform-minded, there is also the question of the degree to which individuals within leadership can question the aims of the party and the supreme leader. And so it's difficult to ascertain the depth of Jang's betrayal. Did he simply suggest a different course, or did he actively try to depose Kim Jong-un before his rule was cemented and grab total power for himself? He very well could have committed real crimes like embezzlement, but even then, was his crime that he tried to amass a fortune, or was it that he stole from the boss? "The revolutionary army will never pardon all those who disobey the order of the Supreme Commander and there will be no place for them to be buried even after their death." The truth of it all is that he questioned the state. In the DPRK, the will of the government is the will of the people, not the other way around. All three Kim's are individually and jointly the total embodiment of the party, state, army, and people. There can be no change to that without, by necessity, altering the very fabric of North Korean society. "No matter how much water flows under the bridge and no matter how frequently a generation is replaced by new one, the lineage of Paektu* will remain unchanged and irreplaceable. Our party, state, army and people do not know anyone except Kim Il Sung, Kim Jong Il and Kim Jong Un."